Vox on the Rox is the first of a series of experimental sonic works to come out of an Art + Science collaboration between Dr. Nigel Helyer of SonicObjects; SonicArchitecture and Dr Mary-Anne Lea of the Institute for Marine and Antarctic Studies at the University of Tasmania. The seeds of the collaboration were planted during the Fourth International Conference on Bio-Logging (Hobart March 2011) when Nigel created an interactive sonic sound map from satellite bio-logging data collected by IMAS, Australian Antarctic Division and French scientists from tagged marine species around sub-Antarctic islands. The collaborators realised that the extensive and extremely complex datasets collected by for example southern elephant seals diving under Antarctic Ice, or transiting across the Southern Ocean, represent a considerable interpretive challenge and provided the potential for a hybrid art and science exploration of new methods and forms for manifesting the data. The project is currently working to develop graphical scores from data that will be played in concert by musicians from the Conservatorium of Music ~ translating digital information via visualisations into sonifications. Vox on the Rox will make a debut at the Conservatorium Recital Hall with the first concert in a series which will explore the marine environments and creatures of the Southern Ocean. The work is in two short ‘movements’ and is accompanied by data projections of the graphical score and environmental imagery. The concert will take place on the evening of Friday 27th April and will be preceded by a short introduction and will be followed by an informal discussion with refreshments provided. Watch this space for details…. 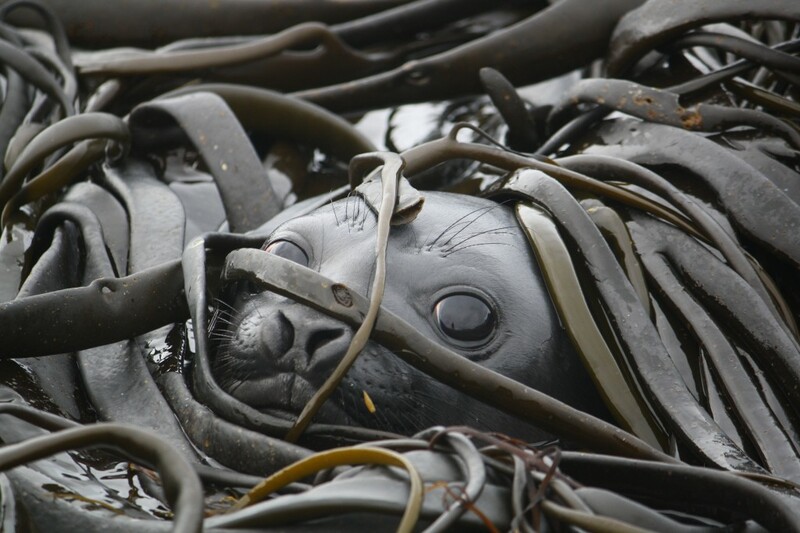 December Field Trip ~ Mammals and Seabirds! December 2011, not so much a baptism of fire, more in the line of traditional cold water ~ as a means of ‘inducing’ myself in the Institute for Marine and Antarctic Studies (UTAS) I attended a three week intensive course on Marine Mammals and Birds of the Southern Ocean which included a residential field trip. 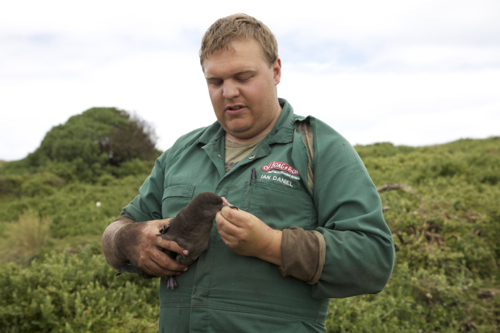 Owen talks to a Mutton Bird on Wedge Island. 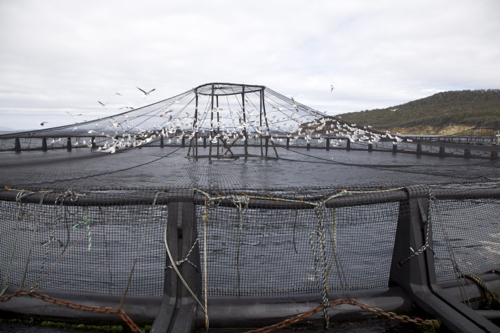 Wildlife interaction studies at a TASAL fish farm. 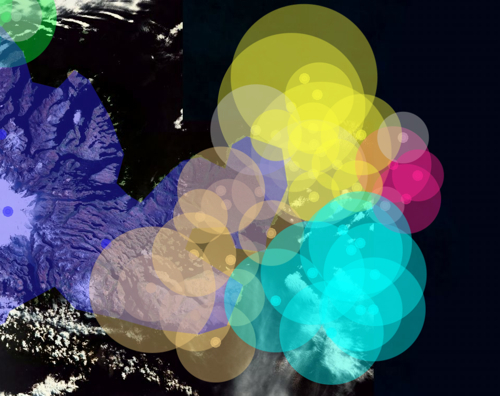 This collaborative project, which builds upon an already established working relationship (CSIRO Bio- logging conference Hobart 2011) seeks to link scientific bio-logging and GIS techniques with the Artist’s interests in interactive acoustic cartography and the development of Audio-Portraits which extend the conceptual and intuitive grasp of otherwise abstract data. We anticipate that the residency be structured around a series of four one month intensive work periods allowing the collaboration to involve a range of research activities and associated technologies. The artist will be incorporated into the working life of the lab, actively participating in field trips to make (for example) hydrophone and ambient recordings as well as water quality measurements and visual documents. We envisage that each of the four sessions will comprise a ten day field trip where the Artist will work directly with a Scientific survey team, followed by a twenty day period in the Hobart lab working with the collected data and developing this into interactive works. 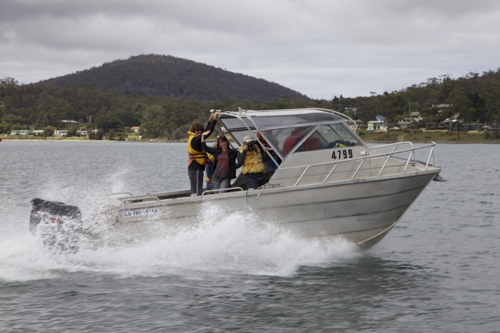 Furthermore we intend to develop strong relationships with the researchers, technologies and a mass of available data within the IMOS (The Australian Integrated Marine Observing System) research network (see http://imos.aodn.org.au/webportal ). Access to this Australia wide network will expand the range and scope of collaborative relationships to include familiarity with various marine tagging and tracking technologies as well as advanced GIS mapping systems. Whilst the nature of the collaboration is best left to develop in an organic fashion we do anticipate some tangible outcomes and are currently exploring exhibition and publication possibilities both within the University of Tasmania and externally. Currently the Moonah Art Centre has offered its facilities as an exhibition venue. Screen grab from the Bio_Logging sonic cartography. Presented by The Australian Network for Art and Technology (ANAT) in association with the Australian Government through the Australia Council for the Arts, its arts funding and advisory body.